Happy Friday everyone - the weekend starts here. The weather in the UK seems to be improving and Sunday is supposed to be hot, hot, hot. I still haven't got my PC back and my post for the Gingersnap VA piece is sitting in Windows Live Writer on it. As I found the photos are still on my camera I thought I would create a new post today to show you what I have done. This week is a colour challenge at Gingersnaps and following with the shopping theme Shar is challenging us to use the colours of our money - so I chose blue, purple and brown - yes you guessed it, the £20, £10 and £5 notes in the UK. This is also for Scrolls Work as a GDT piece. Don't forget to head over and see what is left in their sale where everything is reduced by 60%, they have some fabulous Steampunk stamps. This is a rather arty piece which again I used as a piece of homework for the course I am doing with Claudine Hellmuth which was to create a collage with a horizon line. For the blue background I used dishwasher rinse aid to create the streaks in paint. The main stamped image is from Scrolls Work, the castle image is from Crafty Individuals and the birdcage and car are downloads. Claudine's comment for this piece was - "beautiful horizon line, great colours and nice dominant focal point", so I was pleased with that. Right off to do a bit more to a larger project I am working on this week and I also want to get something made for Grungy Monday. I am also 'working' this afternoon, well it's not exactly paid work today but a meeting to arrange some dates for for next term. Slowly I am getting a few dates in the diary so I will be working a bit in the autumn. My two children have been working at the Paris Air Show this week, I picked Maddie up last night and Ben comes home tonight - the girls have missed him and are looking forward to seeing him back. Have a great day and a fab weekend whatever you have planned. Never mind watch out Holtzie using 'dishwasher rinse aid' Tracy Emin should be worried! Now why do those ideas never pop in to my head .... streaks? Rinse aid!!! Inspired! 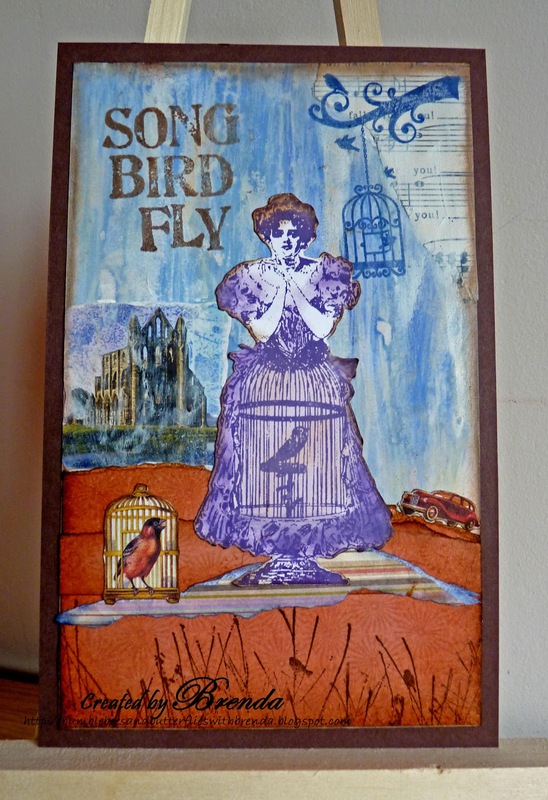 Lovely piece as always Brenda - very creative and loving the use of purple! Oh just divine. You are so very creative Brenda! I'm glad you were able to post your pic. Blogger is not letting me put anything up! Hi Brenda! Beautiful card as always, but here's a laugh. The part that took my eye was the church. That has to be the Abbey ruins in Whitby! I've actually been there! Hope you have a glorious weekend. Enjoy! Ooh love this Brenda! It's perfectly balanced. Love everything - beautiful colours and you have added so many lovely little details. Very creative using the dishwasher rinse! fab project with all those bird cages Brenda....hope the sun will be shining during your weekend! Oh Brenda, what a stunner! Gorgeous collage and I adore your rinse aid technique, it looks fab!